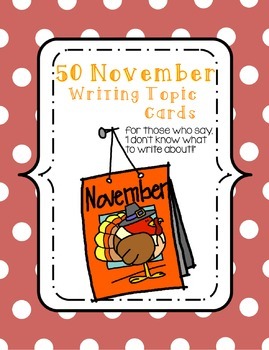 Do you need writing ideas for November? This product contains 50 ideas. Cut them out and put them in a box or punch a hole in each card and put on a ring! You'll never have to hear "I don't know what to write about" again!!!! Each question contains instruction phrases and/or the '5 W's and how'. This aligns with the common core as well as ELA test prep! 1. the hockey mask was invented on nov 1. what is your fav sport? why? 2. nov 3 is sandwich day. list the ingredients for a perfect sandwich. 3. on nov 3, 1957, a dog traveled to space. describe a dog's day in space. 4. nov 4 is national candy day. invent and describe a new candy. 5. nov 5 is national donut day. what are your fav donut toppings? 6. nov 6 is basketball day. list all of the NBA teams. 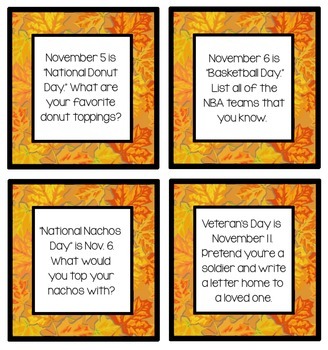 7. nov 6 is national nachos day. what would you put in your nachos? 8. nov 11 is Veteran's Day. Pretend you're a solider and write a letter home to a loved one. 9. write a letter to a solider overseas. 10. nov 13 is world kindness day. list as many acts of kindness as you can. 11. nov 15 is national clean out your refrigerator day. list all of the things in your fridge. 12. nov 15 is america recycles day. why is important to recycle? 13. if you could open your own restaurant, what foods would be on your menu? 14. list the foods you eat on Thanksgiving day. 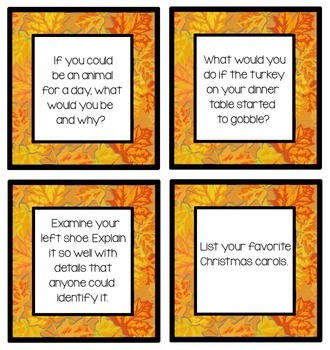 15. describe the activities you do on Thanksgiving day. 16. pretend you were a pilgrim coming to america. write in a diary about your travels aboard the Mayflower. 17. pretend you were a pilgrim who landed in America. write a letter back home to England describing the new land. 18. nov 21 is world hello day. write hello in as many languages as you can. 19. the jukebox was invented on nov 23. compare the jukebox to today's ipod. 20. "Rudolph the Red-Nosed Reinedeer" was released on nov 25, 1949. name all of the reindeer. 21. nov 26 is national flossing day. why is important that we floss? 22. nov 26 is national cake day. describe your favorite cake. 23. november is peanut butter lovers' month. explain why you do or do not like peanut butter. 24. november is national adoption month. what pet would you adopt? why? 25. november is known as noshavember to some men. list all the men you know with beards. 26. write santa a letter explaining what you want for christmas. 27. pretend you are one of santa's elves. describe your day at santa's workshop. 28. national game & puzzle week is november 24-30. list the games you like to play. 29. the second week in nov is "american education week." should you be required to attend school? why or why not? 30. if you were to create a new Sesame street character, who would you create? Describe the character's appearance and character traits. 31. why should we give thanks to our veterans? how can we give back to them? 32. nov 13 is mom and dad's day. write a poem to your mom/dad or whoever is important to you. 33. nov 15 is "pack your mom lunch day." make a list of what you would put in her lunch. 34. write a poem about Fall. 35. what things in your classroom are orange, red, or yellow? 36. create your own holiday. include the date, reason, and traditions. 37. imagine someone is bullying your best friend. what would you do? 38. if you had a superpower, what would it be and why? 39. if you could travel in a time machine, when and where would you travel to? 40. create and explain a new invention. 41. why is important to be respectful to everyone you meet? 42. explain your favorite book. 43. write a story about your teaching being an alligator. 44. imagine you are going to live on a deserted island. list 3 things you would bring and why. 45. if you could be an animal for a day, what would you be and why? 46. what would you do if the turkey on your dinner table started gobbling? 47. examine your left shoe. explain it so well with details that anyone could identify it. 48. how do you like to decorate your house for christmas? 49. explain what you like to do on the weekends. 50. pretend you're on an African safari. what animals would you see?